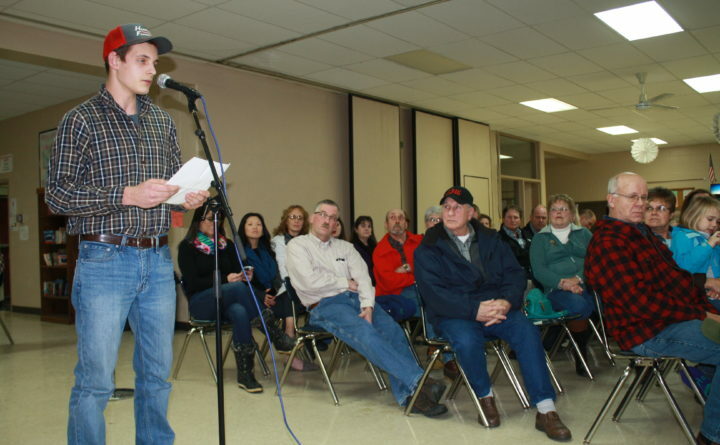 Gavin Hemphill, a Presque Isle High School junior whose family operates Hemphill Farms in Presque Isle, speaks in support of harvest break during a public hearing on Thursday. The SAD 1 school board is reconsidering its 2018 decision to end the three-week harvest break. PRESQUE ISLE, Maine — Dozens of area residents voiced their support Thursday for having the SAD 1 school board reverse its decision to end the potato harvest break in 2019. More than 50 members of the public, many of whom were farmers, teachers or parents, filled the room at the Presque Isle High School cafeteria during the hourlong public hearing, anxiously listening to the folks who addressed the school board on why harvest break matters for both area potato growers and students. In February 2018, board members voted 9-7 in favor of ending the high school’s harvest break beginning in fall 2019, with this past fall established as the final time that students would be able to work temporary farm jobs for three week’s during the region’s potato harvest. Board members based their decision on a survey conducted by the high school that found that only 14 percent of students worked farming-related jobs during harvest break in 2017, 8 percent worked at the SAD 1 educational farm and 35 percent worked in non-farm jobs. The survey also stated that 43 percent of students did not work or engage in community service that year. Much of the board’s decision regarding harvest break centered on concern for the later group of students as well as the potential downsides of having students in all grade levels not participating in academic coursework for three weeks. But at the school board’s Dec. 12, 2018, meeting, member Carol Bell, who had voted against ending harvest break, made a motion that the board members reconsider the decision. Thursday’s pubic hearing is the first of two that the board plans to hold, with the second starting at 5:30 p.m. Monday in the high school cafeteria. One of the local farmers who spoke Thursday in support of harvest break is Deena Albert Parks, whose family operates Chops Ahoy Farm in Woodland. Parks, who also is a member of Maine Agri-Women, stated that like many area farmers she has seen the positive impact that working farm-related jobs has had on high school students, particularly those who weren’t involved in sports or other after-school activities. After her 5-minute speech, which was the maximum time limit for each speaker, SAD 1 board member Paul Saija pointed out that many of the high school students who do not work or participate in community service projects during the harvest break might not do so simply because they live in more isolated areas and lack adequate transportation. Parks replied that she believes there are vast opportunities for the school to provide bus transportation to students who are willing to volunteer their break hours to a community project. Another topic of concern previously brought up by the school board concerned how students in all grade levels would face setbacks in their academics due to the three weeks off for harvest. Kim Hemphill of Presque Isle, a teacher at Easton Elementary School, read a letter from her colleague Amy Sweetser, who also teaches at Easton Elementary and was unable to attend the public hearing. In her letter, Sweetser indicated that for 12 years the Easton school system has conducted testing for all grades before and after harvest break to determine if the time off caused any interruptions in their ability to learn. The test, known as Star 360, measures students’ reading and math abilities and, according to Sweetser, has consistently shown no interruptions in students’ learning. She also stated that as a teacher she has seen more students fall behind during the much longer summer vacation than during the three-week harvest. After reading Sweetser’s letter, Hemphill suggested that SAD 1 look into possibly conducting a similar test to prove whether their population of students are truly affected academically by harvest break. “I don’t have specific scores for the high school students, as I only helped with K through 6th grade testing. But I know that in the elementary school, students’ scores either stayed the same or increased when we tested them after harvest break,” Hemphill said. Kim Hemphill’s son, Gavin, a junior at Presque Isle High School, also addressed the school board on Thursday evening. Gavin Hemphill stated that he has worked full time on his family’s potato farm in Presque Isle — Hemphill Farms — during harvest break for the past three years and that he’s seen firsthand the benefits that the job gives to many of his classmates. One of the final speakers was Tammy Willey, a kindergarten teacher at Pine Street Elementary School in Presque Isle. Willey started by saying that she was in a “different” position than many of the other speakers. She said her son Taylor, who graduated from Presque Isle High School in 2014, was never someone who particularly enjoyed academics but excelled as a student worker for local potato farmers, learning critical thinking and problem solving skills and earning money to pay for his own expenses. But as an elementary school teacher, Willey has concerns about the effect that the early start to the school year in mid-August — due to all grade levels being released in mid-September for harvest break — would have on the youngest students. For a few years now, SAD 1 elementary and middle-school students have started school after Labor Day and not had three weeks off for harvest. But Willey was concerned that the school board might consider reinstating the break for all students. In August, the hot summer temperatures can make classroom time uncomfortable or distracting for many students, she said. Having a break from school so soon in the school year, she argued, could still affect their learning progress. “After hearing the farmers’ stories, I do side with them and support harvest break, but I think the board needs to think about how we can have the break but not have school interrupted for the younger students,” Willey said. The SAD 1 school board will take citizen comments again during Monday evening’s public hearing before taking a final vote on the fate of harvest break. The date for that vote has yet to be announced.